Today’s post is excerpted from The Plot Whisperer Workbook (Adams Media, 2012) by Martha Alderson. Two lucky commenters were chosen to receive a free copy of the book: Tanette Smith and Mindy Halleck. Congratulations! In a scene, a character acts and reacts to people, places, and events. In this respect, scenes are the basic building blocks of your story. But, as with any structure, if you have the wrong scenes or if they’re assembled incorrectly, your story can—unexpectedly—collapse. As a pre-writing exercise, it’s helpful to generate and analyze scenes for your story. If you have a draft of your story, use the scenes you’ve written. If you haven’t finished a draft, use what you have and generate the rest. It may also be helpful for you to try the exercise using scenes from a beloved book or story. If you have no scene ideas, consider what your character wants and then visualize the steps the character will take to get what she wants. Imagine scenes that show her thwarted at every turn. When generating a scene list, do not concern yourself with the specific elements in each scene. Simply generate scenes that show your main character moving forward for a specific purpose and the challenges she faces along the way. Resist the temptation to write the story as part of this exercise. It’s also helpful if you give a very brief title to each scene—no more than one line. If your book is made up of many small chapters, each one encapsulating a scene, list events in the story by chapter. The trick to this exercise is not to see how many scenes you can list. Instead, you want to identify and list scenes that advance the story on a multitude of plot levels. When you find a scene that does not advance the story, you probably need to cut it. More on that below. Whether you write short stories, novels, or memoirs and/or creative nonfiction, you will write countless scenes. Keep in mind the following elements when creating a scene. Just as plot has many different layers, every scene has layers of functions, too. The first layer of every scene deals with time and setting. Often this layer is implied or understood from the scenes and summaries that precede it. Time and setting is crafted to ground readers in the “where” and “when” of the scene. Dramatic action that unfolds moment by moment on the page makes up the next layer of scene. Embedded within layer two is a layer of conflict, tension, and/or suspense. The conflict does not have to be overt, but it must be present in some form. For a real page-turner, fill a scene with tension or suspense or something unknown lurking in the shadows. Setbacks and failure create suspense, conflict, and tension, unlike success and good news, which don’t. Conflict, tension, and suspense drive the reader to turn the page. The character’s emotional development—the heart of the story—motivates that action. Readers read stories to learn about a character’s emotional development. The word “development” implies growth or change. Therefore, character becomes a layer. The change or emotional development at the core of character is yet another. The protagonist hopes to accomplish a specific goal within the scene. Every scene where the character’s goal is clearly understood creates a question for the reader: Will she be successful … or not? Most stories revolve around a protagonist who goes after something, fails, and tries again. Each time life sends your protagonist reeling, she struggles to her feet and tries anew. Since at this point in the story it is best if the protagonist is in worse shape when she ends the scene than when she starts it, bear in mind that no matter how bad things get for the character, they can always get worse. Change is essential to keep your reader’s interest. A character and her emotional state should be constantly changing. If you write a scene where this is missing, chances are that the scene will fall flat and turn your story stagnant. The emotional change the character experiences within each scene does not have to be monumental, but she does have to feel and experience some sort of emotional reaction to the dramatic action in the scene. If not, you’ve done nothing to develop the character, which raises the question: why not? Thematic significance creates the final layer of scene and the overall spirit of your story. The key to the theme lies in your reasons for writing the story and what you want your readers to take away from it. When the details you use in the scene support the thematic significance, you have created an intricately layered scene that provides meaning and depth to the overall plot. 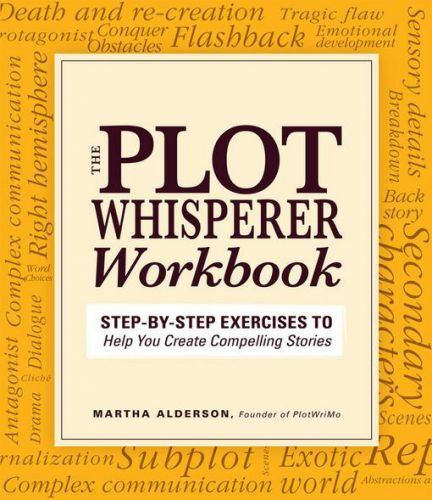 The Plot Whisperer Workbook is full of hands-on exercises and worksheets geared toward anyone writing a narrative work. Find out more at Amazon. Martha Alderson dedicates herself to teaching the structure of plot and has helped thousands of novelists, memoirists, and creative nonfiction writers master plot. She is the author of The Plot Whisperer and The Plot Whisperer Workbook. Great exercise. Scene development is what writers do automatically. Sometimes we forget its purpose is to advance the story. Sometimes we do it just because our creativity takes us down the golden path of too much information and not enough story building. Thanks for the post. After huddling through my first manuscript step by step with only the big picture in ind, I’m trying to learn how to more carefully plan my plotting before I start drafting. This is great! Thank you for the succinct advise and reminders: the scene must move the story forward, it’s over when something changes, but it isn’t over until something does. What I need to remember is how much stronger the story will be if something changes, hopefully for the worse, for the protag. Thought: when the POV changes to another character, not the main, and the protag is “absent” from the scene, still, the scene is hopefully making things worse somehow. I will tend to forget that when developing other characters, flashing back, etc. This helps! That’s a great idea adite – just to have the headers as a visual reminder. I found this really helpful, particularly as I’m at the point in my current novel where I have to turn an unstructured first draft into something resembling a great story. For me, these are great guidelines to follow and to apply to an edit or rewrite. I find it hard to think of all of these things while I am writing the first draft. I usually advise against incorporating all 7 essential elements of scene until after the 1st draft anyway. Until the plot and structure are set there is no reason to go into too much detail because things are sure to shift and be cut and change in the next draft. I know that my memoir first draft could use a good dose of this medicine! Thanks for writing and for posting these succinct tips. Great advice. Scene structure is vital to moving a story forward. The book sounds amazing. I really enjoyed this article. I love the way it breaks down scenes into distinct yet overlapping layers. I do think this concept works better after you have an initial draft of a scene. Usually during a first pass on a new scene I have a few items in mind I wish to include, but only an instinctive understanding of what the scene is about. It is when I am performing editing passes that I can take into account the layering and interleaving of details that make the overall scene/story work. I am stuck in no where land with my plots and characters. Just reading this short piece has given me hope. I am not good set an interesting scene. I hope to read more of this book and finally create a well drafted manuscript and interesting story. This book should be in the hands of every writer. Now wouldn’t that be sweet — PW in the hands of every writer. Yes! Hi all! Fun to read your comments. Sharon, I love what you wrote:”…our creativity takes us down the golden path of too much information and not enough story building.” How true. This is a great giveaway; I am writing a mystery novel and could use this book. Hope to put it on my reference bookshelf soon! Thank you so much for this elegant approach to explaining scene and character. Always keeping character emotional development in mind is going to be my touchstone from now on. And your touchstone will always keep you on the right track. This is applicable to many different genres. Structure is by far the most important element because no matter how good the writing is- the reader must be able to make sense of it. Thanks. Helpful information! A scene can be so overwhelming to balance all the elements so checklists like this are awesome. I’m enjoying your book. I do plan out scenes in my head. I will now start writing them down. Thank you for this! I love the line “they can always get worse”. than I could catch them. This was a great reminder. After rereading a chapter I wrote this morning I had to ask myself, “why would anyone care about this?” If there is no tension or development then what is the point? Thank you for the giveaway! These hints are practical and necessary for any writer! Will share this with my writing group and take it to heart myself! This looks like a very helpful read. Thanks for posting! Great stuff. I have always believed that good writing is good thinking. Here are some tools to accomplish both. Nice. This taste definitely whetted my appetite to read the whole book. Such excellent advice! If there is anything I need in my writing it is what the title says. I was fortunate to attend a couple of Martha Alderson’s “Blockbuster Plot” weekend workshops when she lived in Northern California years ago and have most of her books. Martha’s visual approach to structure and step by step process have been invaluable! She’s also a gem–knows how to calm anxious writers and get them moving forward. Congratulations, Martha! What a nice thing to say, Liz. Thank you! I remember you… and loving your story. I’m still in Northern CA — Santa Cruz and loving it. Thanks for stopping by to say hi. I really needed this today. I’m writing the dreaded – well I dread them anyway – middle scenes where my hero and heroine think they’ve found a way to be happy together. This subtle tension is so much harder to write than the dramatic stuff. I’m printing this out for a reference. Thanks, Martha! This is such a useful post. I like Martha’s blog, but this post really sums it up for me. The scene is the smallest unit in your story, but in many ways the most important one. Follow these guidelines and you can’t go wrong. Thanks, Martha. Thanks for your kind words, CG. I presently revising my first (public) draft. This will help immensely in this process. Thanks much! Thank you, Martha and Jane. This is helpful. Great timing, reading this today. I was just thinking about the points Martha Alderson makes as I wrap up the last edits/revision of my novel before forwarding it to a reader. Thank you! Yes, I agree, Heloise. This is a great final test before letting your piece go. Oh golly gosh. For a novice writer attemting to finish her first novel this is 50 shades of pure gold! When a scene fails to advance a story you should probably cut it- ahhh penny drops and word count may now be tamed into submission. Thank you. I was telling my students today that they must develop the scenes so that people can visualize what is happening. The book looks very interesting and should be quite helpful to a young writer. It would be great to have a copy. Love the simplicity of these steps! Just in time! The perfect tool for refining my just finished novel to polish up some scenes for submission. Awesome! I’m editing my first book now. There is one scene in particular that really needs work. This is really helpful. Sold. Agree that these 7 should be posted as a visual reminder as I’m writing. Perhaps more importantly, as I’m RE-writing. Great exercise (perfect for natural plotters and not too intimidating for natural pantsers!). I recently attended an author event where he said he generates scene outlines as Twitter updates, as if from the main character’s account. He said it forces him to summarize the scene in 140 characters, using only the most important event/point of that scene. I might give that a try alongside your exercise here. Thanks for sharing. Thanks, Martha. I struggle with keeping dramatic tension in each scene. This certainly helps! Thanks, A Very helpful checklist. With second draft of my travel memoir that covers 8 years, I need to cut alot, thus determine what stays–but further, what to leave as narrative and what to develop as a scene. Thanks for the well structured tips.